(Reuters) - The Force remains strong with the new "Star Wars" movie, which is on track to top $1 billion in global ticket sales this weekend, making it the fastest-ever film to reach that level. Walt Disney Co said in a statement on Saturday that "Star Wars: The Force Awakens" had generated box office receipts of $890.3 million globally through Dec. 25 and would pass $1 billion this weekend. 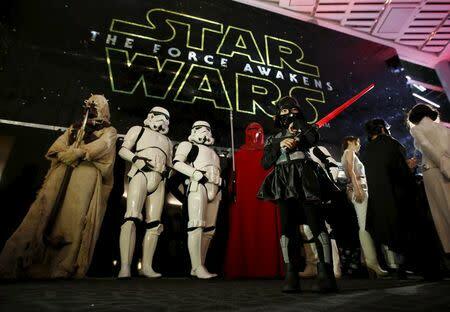 The movie, the seventh installment in the newly rebooted Star Wars franchise, opened in some international markets on Dec. 16 before rolling out in North America the following day. The current record holder for being the fastest to gross $1 billion is Comcast Corp-owned Universal Pictures' "Jurassic World," which took 13 days after its release earlier this year, Rentrak said. The new "Star Wars" movie had already topped "Jurassic World" for the biggest opening weekend ever with $529 million globally. Disney said "Star Wars" has rung up $440.4 million in U.S. and Canada ticket sales and $449.9 million internationally, and it is set to open in China, the world's No. 2 movie market, on Jan. 9. 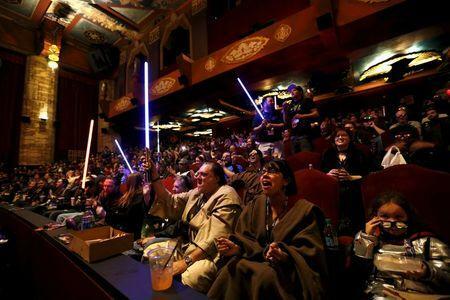 China is crucial if Disney's first foray into the world of Jedi knights is to earn a spot among the top-grossing films of all time. On Friday, "The Force Awakens" set a U.S. and Canadian record for largest box office on Christmas day with $49.3 million, Disney said. That topped the previous record of $24.6 million set by "Sherlock Holmes" in 2009. Disney purchased the "Star Wars" franchise from George Lucas' Lucasfilm in 2012 for $4.05 billion, and has planned for a new trilogy of films as well as standalone installments through 2019. The franchise will also be incorporated at U.S. Disney theme parks, bringing to life the droids, spaceships and otherworldly creatures of the universe that Lucas created in 1977 and is set in a galaxy far, far away.